New Jersey's best rocked the New York City Armory with several jaw dropping, electrifying, and breathtaking performances at the 85th annual Eastern States Championships on Tuesday night. Just how awesome was NJ at this meet?? Both distance medley relay winners produced US#1 times, Mario Heslop nearly broke two state records, Sincere Rhea and Grace O'Shea ran two of the fastest hurdle times in state history, Leah Ellis became the top freshman long jumper in state history, multiple county records went down, and many athletes and teams shook up the state and national leaderboards. In the boys DMR, Christian Brothers Academy took the lead for good on the 400 leg on the way to a US#1 10:12.18, No. 5 in school history. 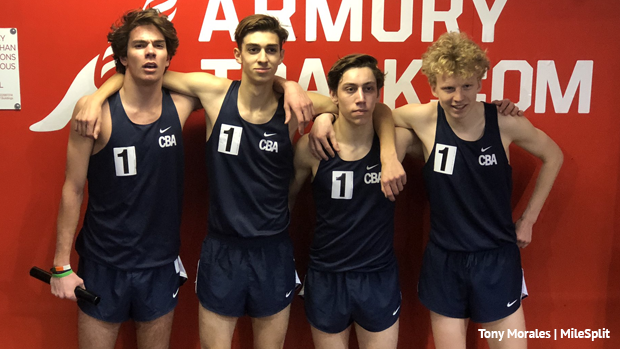 CBA's splits were 3:08.45 for the 1200m by Shaw Powell, 50.01 for the 400m by Liam O'Hara, 1:59.86 for 800m by Tristan Amell, and 4:13.87 anchor for 1600m by Tim McInerney. The girls DMR was dominated by Union Catholic, which blitzed the field with a US#1 and Union County record 11:59.38. North Hunterdon was second in a NJ#4 12:14.14. The former Union County record was 12:01.3 by Summit in 1981. 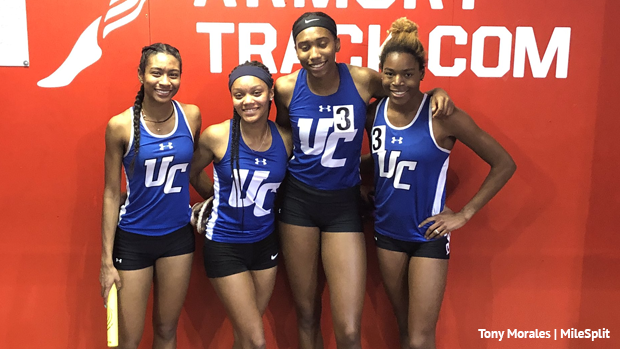 UC's splits were 3:42.96 for 1200m by Leena Morant, 59.90 for 400m by Avery Jordan, 2:21.86 for 800m by Morgan Williams, and a huge PR of 4:54.68 for 1600m by Jerika Lufrano. It's the first time Lufrano has cracked 5:00. Heslop, a senior at Franklin, was his usual sizzling self. He won the boys 55m dash in 6.35 after running a US #2 6.32 in the trials, and a then he won the 200 in a US#2 tying 21.11. Those times are just off the state records of 6.26 and 21.09 that Heslop ran at Easterns last year. James Bivins of Donovan Catholic was second in the 55m dash in a school record and NJ#5 6.46, and Richie Luzzi-Liggins of St. Peter's Prep was third in the 200m in 22.07 after he dropped a NJ#3 21.77 in the trials. O'Shea had a huge meet for Ramapo. The senior won the girls 55 hurdles in a NJ#3 all-time 7.75, which is tied for US#2 this season, and ran on the 4200 that smashed the Bergen County record in the trials with a 1:44.39. Only Olympian Sydney McLaughlin of Union Catholic (7.60 in 2015) and Charmaine Walker of Plainfield (7.71 in 1997) have run faster than O'Shea in the hurdles in NJ history. The boys 55m hurdles was just as remarkable as Rhea, a senior at St. Augustine, blasted a US#2 and NJ#5 all-time 7.20. In the girls long jump, Ellis of Millville surpassed her PR by 16 inches when she soared 19-3 to not only finish first, but she also shattered the state freshman record, took over the state lead this season, moved all the way up to No. 11 in state history, and is now tied for US#13 this season. The 19-3 by Ellis crushed the state freshman record of 18-9 that Tionna Tobias of Winslow set when she was third at Easterns in 2016. Jamier Wright-Collins of Paterson Kennedy won the high jump by matching his NJ#1 tying mark of 6-8. Ivan Jacob of Bergen Catholic was second with a PR of 6-4. The Rancocas Valley girls smashed its school record when it burned a NJ#1/US#12 1:41.99 to place second in the 4x200. Sophomore Sheriyah Nutt blasted a 24.88 anchor leg for RV. In the girls 4x800, the Ridge girls dropped a NJ#2 9:15.07 to finish first, Red Bank Catholic was second in 9:26..54, and Rumson took third in 9:27.03..
Ridge received splits of 2:20.68 from Manon Stephen, 2:17.93 from Olivia Cicchetti, 2:22.81 from Tatum Peskin, and 2:13.65 from Morgan Lyons. East Brunswick captured the boys 4x800 in a NJ#4 7:55.59, which smashed the school record by 10 seconds. Bergen Catholic was second in a NJ#7 8:01.63. Nils Wildberg of Princeton, who has been sidelined with knee injury for most of the season, made a triumphant return by equaling his NJ#1 mark when he won the boys long jump with a 23-4.5. In a great high jump battle, Bethany Biggi of Rancocas Valley finished first on misses with a PR of 5-6. Amy Aririguzoh of Lawrenceville and Abrianna Barrett of Montgomery tied for second, also making 5-6. Biggi made 5-6 on her first try and Aririguzoh and Barrett each made it on their third attempts. Orion Joyner of Kingsway extended his state lead in the triple jump with a 46-0.25 to place second. Liam Landau of Pascack Hills, the state leader in the pole vault at 15-9, won on misses at 15-0. Dennisha Page of Woodrow Wilson ran a NJ#2 24.57 in the 200 trials and was secomd in the final in 24.75. Mariah Fede of Paramus Catholic ran a Bergen County record 24.66 in the girls 200 trials and was fourth in the final in 24.86, and Shauntae Nelson of Piscataway ran a Middlesex County record 24.81 in the 200 trials and was third in the final in 24.84. Denae Hill of West Orange moved up to NJ#3 with her winning throw of 41-10.5 in the girls shot put. Caroline Dannenbaum of Pingry cleared 12-0 to place second in the pole vault. Emma Cunningham of Ramsey won the girls TJ with a mark of 37-6.25. Sarah Adams of Ramapo went NJ#3 2:14.77 to place second in the girls 800. Rebecca Ochan of Highland Park ran a NJ#4 56.88 to place second in the 400. The Jackson boys ran a NJ#3 3:23.51 to place second in the 4x400. Jared Cooper of Mountain Lakes placed second in the two-mile in 9:29.24 and Jon Fontana of River Dell was fourth in a school record 9:30.52.